Louis Armstrong, Captives On The Carousel, Screaming Maldini, Sons Of Kemet, Animal Collective and more. 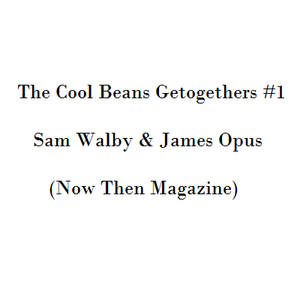 And thus begins The Cool Beans Getogethers (or CBGs for short), where Chris Arnold sits down with people who do things. Things that might be of interest to you. If these things we speak of may be of interest to you then please, continue reading. Gracing the radio microphones for the debut CBG are the eloquent Sam Walby & James Opus from the Sheffield & Manchester monthly publication - Now Then Magazine. On the show they chat about the work that goes in to the mag, the reasons for creating it in the first place, their trials & tribulations and plans for the future as well as playing a variety of hand-picked musical numbers. The trio also look at the day&apos;s best Tweets, talk about Hobbits and hear some news from the gone-but-not-forgotten Welsh Whisperer. Taken from the Cool Beans Takeover on the Peace in the Park Radio on Sheffield Live on the 28th February 2014.